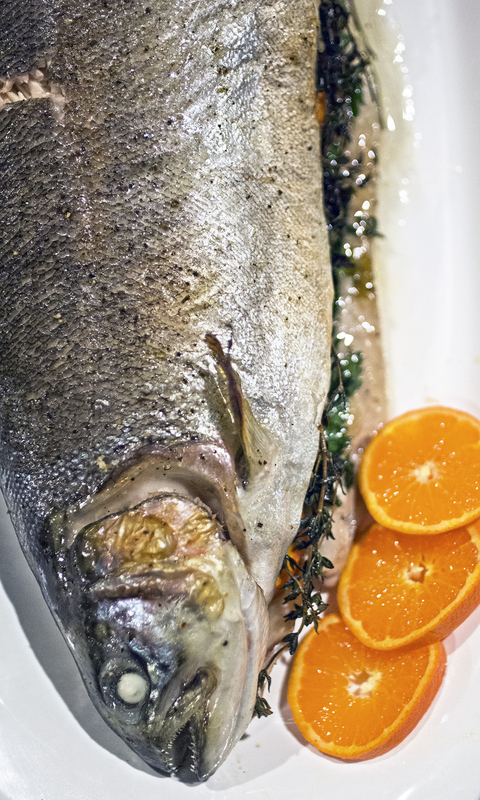 Cooking a whole fish is actually very easy, so easy you don’t even really need a recipe. First, gut and clean the fish, and make sure the hook or fly has been removed. (This should be done pretty immediately after catching it.) Rinse the outside and pat dry with a paper towel. If you’re afraid the fish is going to be fishy or taste like lake bottom, soak it in milk overnight. Line a pan with foil and preheat the oven to 450. Salt and pepper the fish, inside and out. Rub/brush the outside of the fish with olive oil or melted butter. 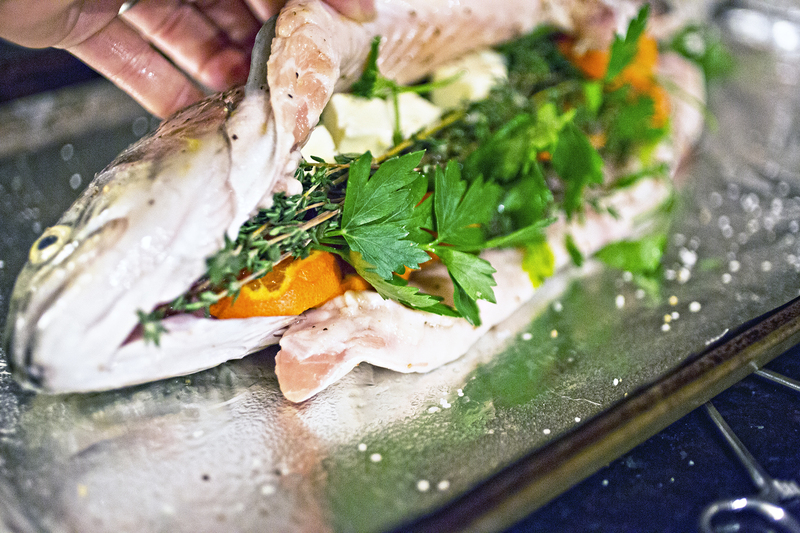 Then stuff the fish with fresh herbs, citrus slices, and pats of butter (or rub/drizzle the inside with olive oil). I used clementine slices, parsley, thyme and butter, but really anything you got going on in your fridge will do. Bake for about 15-20 minutes, depending on its size, until the flesh is cooked all the way (you can tell because it gets flaky). After that we just kind of put it on a platter and carve into it. It is not pretty, but it is delicious. Any butter/oil that accumulates in the pan can be drizzled over the fish on your plate. Also, be very careful of bones. Zombie fish, on my plate. So that’s it! Clean, season, stuff, bake.